This is probably the shortest recipe I have posted here. Simple and so easy to make. Great for meals accompanied by salad or a vegetable dish. Lechon means a roast, while paksiw is a Filipino cooking method of stewing meat in vinegar. This dish is more or less a way of recycling pork lechon using the roasted meat and its accompanying liver sauce. Although for me this is the only thing I wait for in a pork lechon. I'm not really fond of the roast itself. When we moved to HongKong, I looked for a substitute for the Filipino pork lechon and found a worthy one in the regular Chinese roasted pork. I have to adjust the soy sauce of course because the Chinese version is much saltier than the home variety. So in case you're using the regular lechon, double the soy sauce measurements. I used the Mang Tomas brand of regular liver sauce. They have the spicier version as well which you can use to give it a little kick. Mix all ingredients in a saucepan (preferably non-metal). Bring to a boil. Turn down heat to low and simmer for about 40 minutes or until meat is very tender. Around 1996, when the internet was in its infancy, few people were going online, there weren't any web-based forums and all you have are either the techie's bulletin boards (BBs) or the Usenet. I discovered the latter and it was like a hallelujiah moment for me, like an alladin's cave was opened. I saw hundreds, no maybe more than a thousand discussion groups that talk about, chat, argue on things and topics ranging from gardening to national cultures. It was a virtual circus and it was so wonderful to discover it and be among people online. I plunged right in and subscribed to several discussion groups of which my favourites were rec.food.cooking (RFC), rec.food.recipes (RFR), and soc.culture.filipino (SCF). But of course hands down, the group that I read the most is the RFC. It attracted a lot of die hard foodies, chefs, talented cooks, or just the plain curious. I gained a lot of cooking tips, recipes, where to find the best restaurants in which cities, etc. The people you can find there are a great mix and it's always entertaining to read the exchange of ideas, recipes and insults (flaming) that were brewed by this diverse combinations. I will always recall with fondness the 'characters' that I've 'met' there and in the process acquired a number of great recipes from these generous cooks and foodies. So here's to you RFC - cheers! 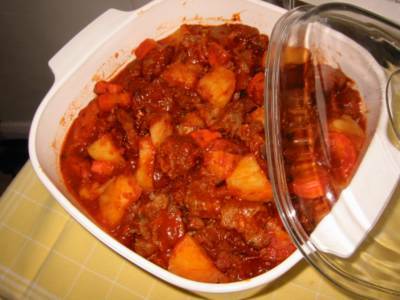 You may have a hint now where this is going, this recipe is from an RFCer - Barb Schaller. She has a number of interestingly titled recipes in the unofficial RFC website of signature dishes. This one is quite easy to make, besides the buttermilk, all the other ingredients can be easily perused wherever you are in the world. And you don't have to do it in a Bundt or tube pan; any pan would do, you just have to adjust the baking times for these. The cake is a bit on the fudgy side and not very sweet which suits me quite well. Finally, this was done by my son as a birthday gift for his sister who had her birthday last Sunday 24th October. Of course his mum did all the mopping up afterwards - heh - bummer! Preheat oven to 350F. Lightly oil a 12-cup Bundt pan (or tube pan) or coat it with non-stick cooking spray. Dust the pan with flour, invert and shake out the excess. In a large mixing bowl, whisk together flour, granulated sugar, cocoa powder, soda, baking powder, and salt. Add buttermilk, brown sugar, eggs, oil and vanilla; beat with electric mixer on medium speed for 2 minutes. Pour batter into prepared pan. Bake for 40-45 minutes or until a cake tester inserted into centre comes out clean. Cool the cake in the pan on a rack for 10 minutes; remove from pan and let cool completely. 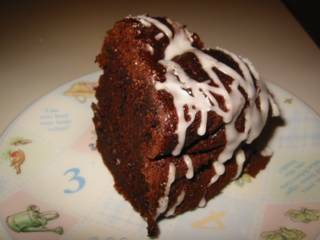 *For the icing: Mix buttermilk with the icing sugar enough to make a thick but pourable icing. Set cake on a serving plate and drizzle the icing on top. *Note: If you don't have any buttermilk, you can make some: for every cup of buttermilk, put in 1 Tbsp vinegar or lemon juice in a non-metal container then add milk to make 1 cup; do not stir, let stand and curdle for about 5 minutes. When my mother wanted to 'extend' the whatever meat we had for a meal, she would buy a little minced/ground pork and cook this dish. Making sure that there are a lot of potatoes, peas and carrots in it. 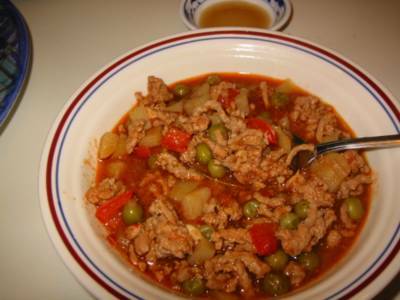 This is the version of picadillo that I know from childhood. The standard picadillo in the Philippines is usually made of beef. I think my mother used pork because first, she doesn't eat beef; second, pork is cheaper than beef and cooking and stretching this dish is all about economics. Now that I closely looked at it I realised it is a variation of the Afritada recipe of hers. It's just that all the vegetables are cubed. Nevertheless, me and my family do enjoy this especially if fresh tomatoes are used. Heat oil in a pan. Saute garlic and onion for about 2 minutes or until onion becomes translucent. Add tomatoes and salt and saute for a further 2 minutes or until the tomatoes are half cooked. Add soy sauce, mix a little then add the minced pork. Cover and simmer for about 5 minutes mixing it every once in a while. Add water and tomato puree. Bring to a boil. Add bell pepper and bring heat down to a simmer. Simmer for about 30 minutes or until meat is done/tender. Add potatoes and carrots and simmer for 3 minutes. Add peas and simmer for another 3 minutes or until all the vegetables are cooked. Serve. 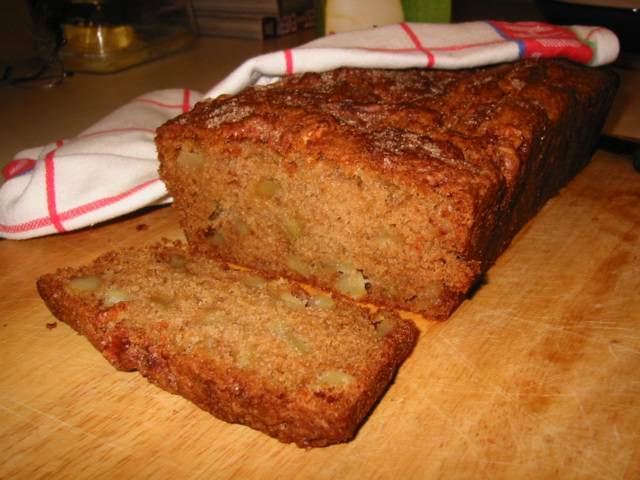 This recipe is adapted from the same magazine and article as my previously posted Apple Cake. It is by Fern Raleigh of Windom, Kansas and won the top prize in the Kansas State Fair. Very easy to make and if you choose you can do the mixing all by hand. Although using an electric mixer will give you better results. It originally says to bake it in a loaf pan but I used muffin pans and reduced the baking time and it's still good. Like the apple cake, this is supposed to be a "bread". Again I took the liberty of calling it a cake since the end product is quite sweet. As usual I reduced the sugar by a lot - it was supposed to be 1 1/2 cups! At 1 cup it still is sweet. The nuts for me is optional, I have often done this without it and it does not seem to affect the result much. Please see the note below the recipe for the substitute for buttermilk. My children behaved a little better this time around. 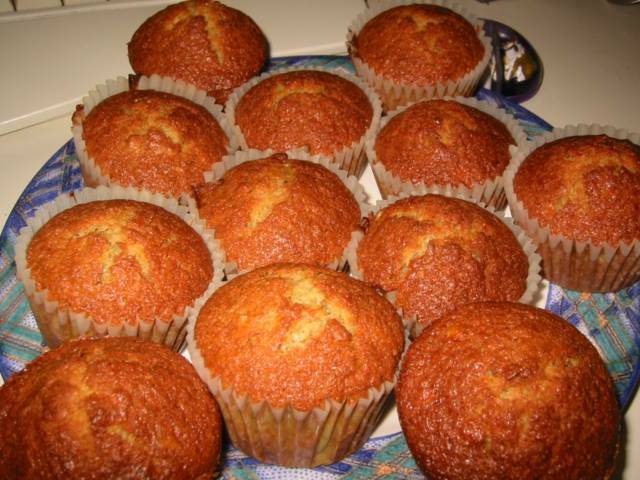 Before, once the muffins come out of the oven they start eating it and soon I am left with more than a dozen muffins with no tops! Preheat oven to 180C/fan 160C/350F/gas mark 4. Grease a 9 x 5 x 3-inch loaf pan with butter or shortening (or put paper liners in a 12-cup muffin pan). Sift together flour, baking soda, baking powder and salt in a container. Beat together sugar, butter and vanilla at moderate mixer speed for about 5 minutes until light and fluffy. With mixer running, beat in eggs, then bananas. Stir in walnuts. Spoon batter into prepared pan, spreading well to corners. Bake in preheated oven for 55-60 minutes (25-30 minutes for muffins) or until loaf is richly browned, begins to pull away from the sides of pan and is springy to the touch. Cool bread in wire rack for 10 minutes. 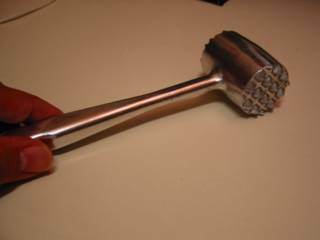 Loosen loaf around edge with a small thin metal spatula. Invert; turn right side up. Cool completely. *Note: If you don't have any buttermilk, you can make some: for every cup of buttermilk, put in 1 Tbsp vinegar or lemon juice in a non-metal container then add milk to make 1 cup; do not stir, let stand and curdle for about 15 minutes. Mix beaten eggs with the salt, sugar, soy sauce, pepper, and garlic. Making sure that the salt and sugar are dissolved in the liquid. Mix in all the other ingredients thoroughly. Wrap tightly in spring roll wrappers (for the 'how to' see below or click here for the proper way of wrapping and here for the lazy way). Deep fry in hot oil for about 4 minutes or until the wrapper is golden brown and crunchy and the pork filling is cooked. Serve with sweet and sour sauce or Thai sweet chili sauce. *Note: If shrimps and water chestnuts are not available you can omit these then adjust recipe by reducing the garlic and egg to just one each and halving the measurements for salt, sugar, soy sauce, and pepper. 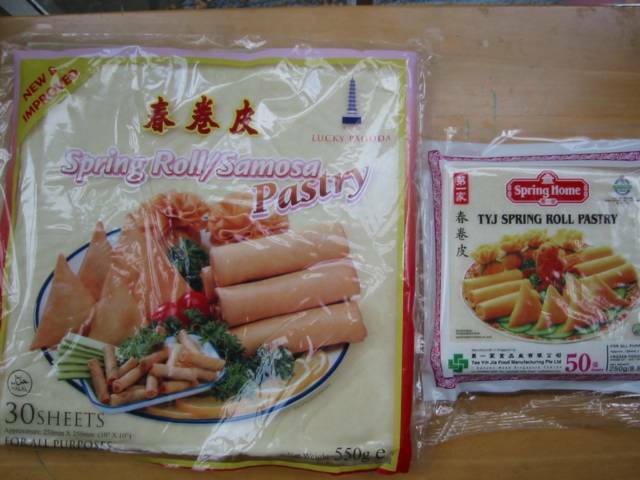 First, you need spring roll wrappers of about about 5 x 5 inch square. 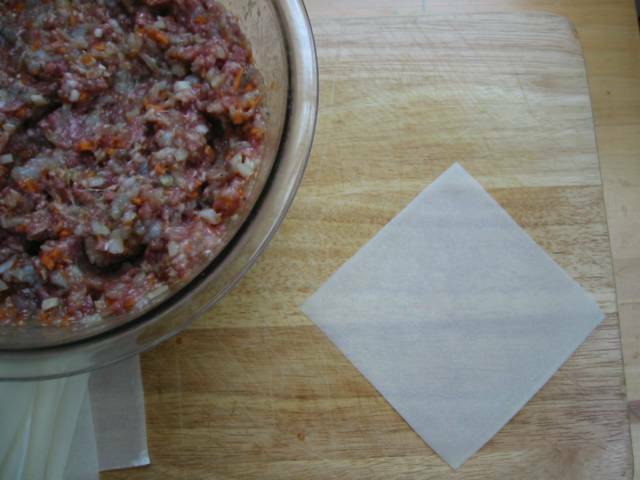 If it's not available, buy the large one (about 10 x 10 inch square) and then cut them to size. Secondly, make the flour 'glue' that you need to secure the spring roll wrapper. Mix 2 Tbsp flour with 2 Tbsp water; combine it thoroughly to make a very thick paste. Step 1: Take a wrapper and position it so that one of the corners is pointing towards you. 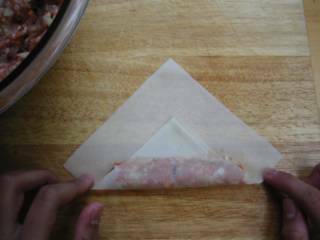 Step 2: Put around 2 teaspoonfuls of the pork mixture and shape them like a log horizontally at the lower half of the wrapper. Step 3: Take the edge pointing towards you over the pork mixture. Press the wrapper over the mixture, making sure it is snugly wrapped. 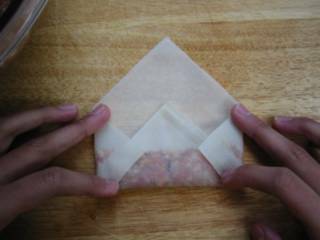 Step 4: Fold the left and right edges of the wrapper over to the centre forming something like an envelope. Step 5: Roll the wrapped pork mixture like a log in a direction away from you. Make sure to roll it tightly or else it might break open when you fry it. 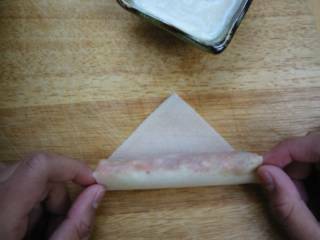 Step 6: Put some flour 'glue' at the remaining edge and roll it all the way through. 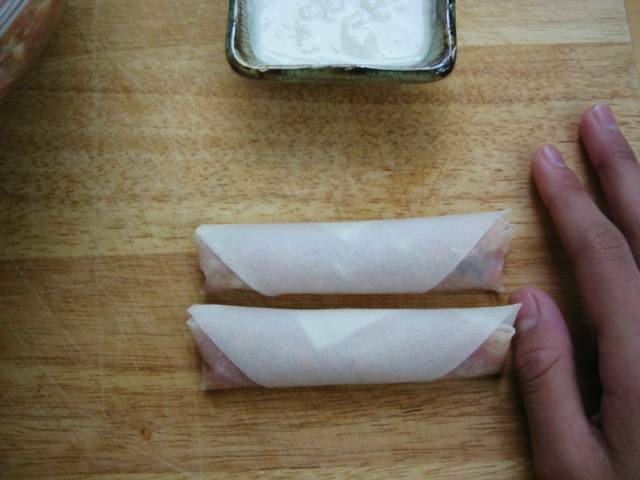 Your spring rolls should look like these. Step 1: Take a sheet of a large spring roll wrapper (about 10 x 10 inches square) and cut it in half. Step 2: Get one of the halves and put about 3 tablespoonfuls of pork mixture and form it into a log at the lower end of the wrapper. 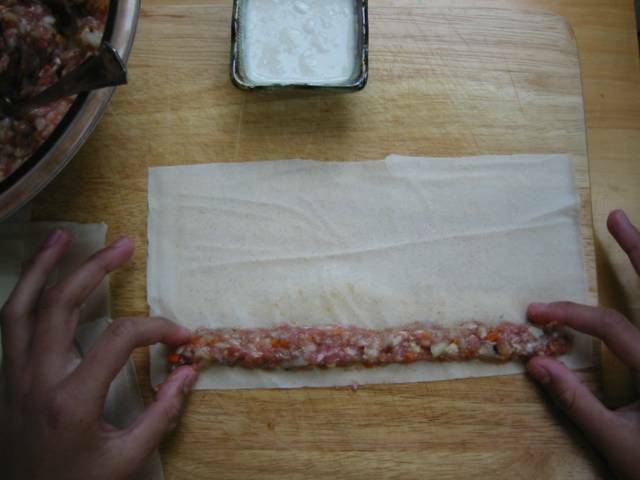 Step 3: Roll the meat mixture in the wrapper in the direction away from you making sure that it is rolled tightly. Spread some flour 'glue' all along the far end of the wrapper. 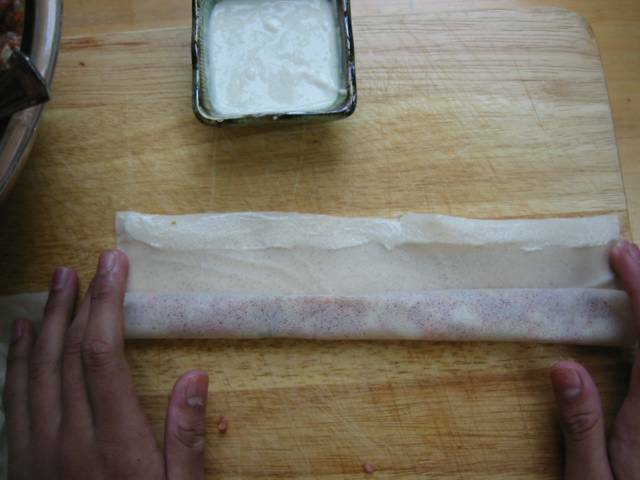 Step 4: Roll the mixture in wrapper all the way through securing with the flour 'glue'. 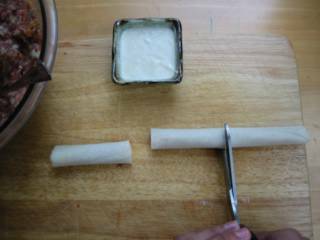 Step 5: Cut the finished log with a knife or scissors at about 3 inches long in each section. If you can't find one, just use a wine bottle (wrap in plastic if it still has paper labels) or use the back of your big knife like a cleaver and bang away. Don't take out your frustration on it too much, make sure the chops are still intact. Since it is pulped it does not have to be marinated for a long time. The only problem I found is that it kinda burn easily because of the sugar in the marinade. Otherwise it is straight forward to do and quite good to have with rice, salad, soup or Ginisang Munggo (Sauteed Mung Beans) much like Purple Girl's dinner. This is adapted from the Chinese Cooking for Beginners by Huang Su-Huei. Tenderise the pork chops with a meat mallet or the back of a big knife like a cleaver. Except for the pork chops, combine all ingredients in a container. Add in the pork chops and marinate for at least 1 hour. 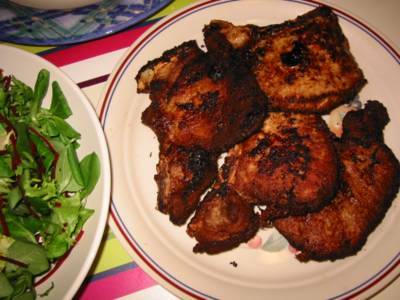 Pan fry or deep fry the pork chops for 5 minutes or until they are golden brown and thoroughly cooked. Dish up and serve. My son and I came home to the Phils. a few years ago. It was his first time there. We were sleeping when he was periodically woken up by the crowing of the rooster very early in the morning. He became very annoyed and asked, "Why does that rooster keep on crowing?". I said, "Well, that's his purpose in life to crow every morning or be in a tinola." He he! What a round about way to allude to this recipe. This is chicken in a clear soup. Very satisfying and one of my comfort food with special value when I'm ill. For me the dominant flavour (besides the chicken) should be the ginger, then the patis (fish sauce) and then the chili tops adds a piquant flavour as a finish. 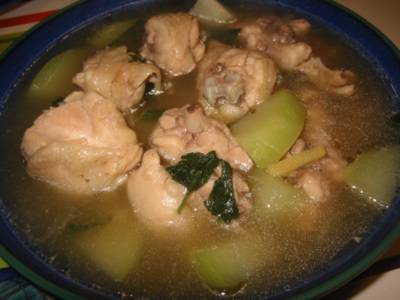 It is also important to let the chicken to simmer in patis before adding the rice water to make it tasty. I almost always use rice water since it markedly improve the taste of the soup as against using plain water. So as much as you can use rice water. As I said, this is more or less a clear soup so the quality of the meat will be very noticeable. Hence, use the freshest and most wholesome chicken meat you can get preferably organic. My lola (grandma) would use freshly slaughtered dumalaga (single, unmarried, no eggs or chicks yet) chicken. It always was a treat to eat (since we only have it when a chick had grown big enough), slurping the hot soup with enthusiasm. The only distressing thing was when she tried teaching me to slaughter a chicken. I can dress an already dead chicken but not slay a live one. She taught me well on scaling, cleaning, and preparing fish, squids, shell fish, crabs, etc. mercifully she did not force me on poultry butchering after my first try. But such is the reality of life in the rural area, if you cannot slaughter it then you do not eat it. It's a wonder I did not turn vegetarian. Peel chayote with a potato peeler and cut in half along the groove in the middle. Take out the white pith and seed in the middle using a spoon. 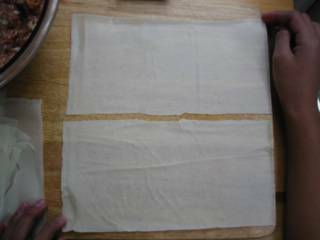 Cut each half lengthwise and cut again crosswise (or diagonally) in about 3/4 inch intervals. Set aside. Heat oil in a heavy-bottomed pot. Saute garlic and onion until onion is translucent. Add in ginger and cook for about 3 minutes or until aromatic. Add the patis and chicken. Stir well. Cover and cook on medium-low heat for about 5 minutes letting the chicken abosorb the patis. Stir occassionally. Pour in rice water and bring to boil. Bring down heat to simmer and cook for about 30 minutes. [optional] Skim off excess fat floating on top. Add chayote, bring up to boil again and cook for 5 minutes or until chayote is done. Put in chilli tops and cook for about 1 minute. Serve while hot. *Note: Rice water is the water drained and saved from washing rice before cooking. So you should really cook rice before doing this dish. It's one of those days, I've got some ingredients and am just too lazy to think on what to cook with it. So I have some Chinese cabbage, some beef and came to a stir fry recipe in the Chinese Cooking for Beginners by Huang Su-Huei. The preparation for the meat made me miss the butchers in Hong Kong where if you tell them to cut the beef for stir frying then they slice it oh so very thinly, almost paper thin actually. And because they're so thin, it only takes you a few minutes to cook them. Really nice. In this recipe, I suggest you use the 'premium' oyster sauce since they do taste a lot better than the regular ones. I guess I cannot really recreate a Chinese restaurant-quality stir fry since you need a really hot stove for that. I don't know if you've seen the ones in their kitchens. It has a pedal at the bottom that as you press on it, spews out a blast of flame which actually sounds like a jet engine. You need great heat like that to quickly cook the outside and seal the juices inside of the food. It also imparts that smoky, a-tiny-bit-burnt smell and taste - I forgot how they call it in Chinese. For now, I have to make do with the 'high' setting of my electric stove. Mix cooking wine, soy sauce, cornstarch, and water. Add in sliced beef. Marinate for at least 1 hour. Precook vegetable. For nappa cabbage: heat wok and add 3 Tbsp oil; stir fry cabbage with 1/4 tsp salt until it becomes limp. For broccoli: steam for 2-3 minutes or until done. Remove to a serving dish. Set aside. Add 1 Tbsp oil to the marinated beef, mix well. Heat the wok and add the 1/3 cup oil. Stir fry beef until almost cooked. Remove from oil and set aside. Reheat wok and add 1 Tbsp oil; stir fry the green onions and ginger until fragrant. Add beef and sauce mixture. Turn heat to high and stir quickly to mix. Remove and place on top of the vegetable. Serve. The title reads in English - 'The Eternal Almondigas'. Eternal because if my son can get away with it he would eat it everyday. Now that he learned to cook this I think I have to really rein in on him. 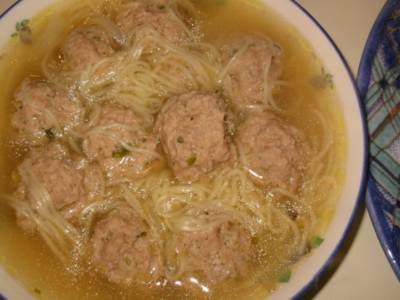 The dish is essentially meatballs with noodles on a clear soup. There are a lot of variations of this in the Phils. 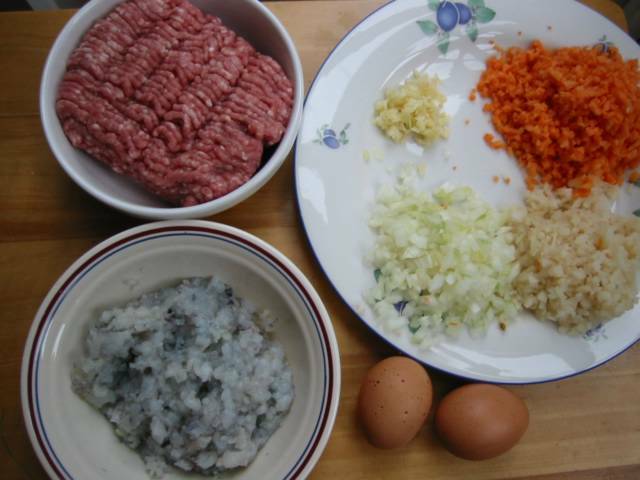 Some put leafy vegetable in the soup, some add more ingredients in the meatballs. But this is the most basic I have seen around and probably the easiest to do. The noodles is what we call miswa in Phils. which is very fine, hair-thin noodles made of flour. If you can't find this you can substitute with Chinese or Japanese flour noodles. Just buy the thinnest one you can get. Finally, this is delicious eaten with a toyo (soy sauce) and lemon dip. Mix beaten eggs, pepper and soy sauce. Add pork and chopped onions. To bind, add flour and mix well. 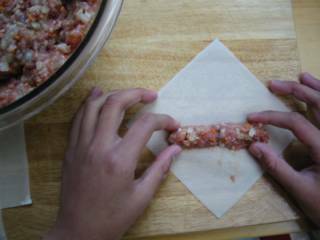 Form the pork mixture into 1-inch balls and set aside. In a pot, heat oil and saute garlic and onion. Cook until onion is translucent. Add in patis. Pour in the stock and bring to boil. Add meatballs to the soup. Bring to boil again. Lower heat and simmer for about 30 minutes. Add miswa and cook for about 2 minutes. 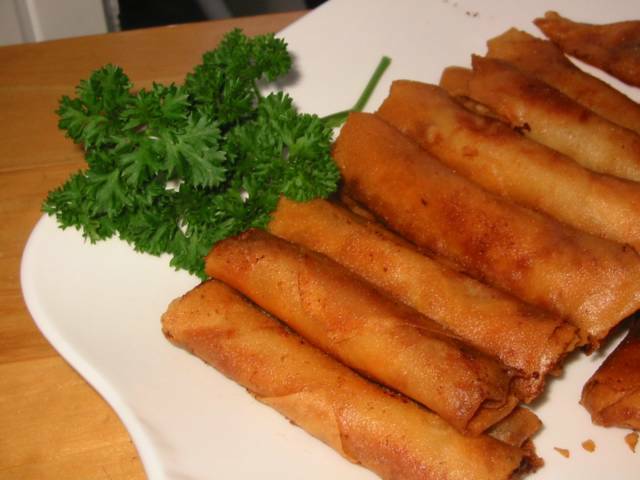 Serve with lemon and soy sauce or patis (fish sauce). A work colleague of mine requested that I post vegetarian dishes and here is one. As usual this is courtesy of my esteemed Chinese Cuisine cookbook by Huang Su-Huei. This is my kind of recipe - very simple, very easy to do and very few ingredients. It originally called for the tofu to be fried in a wok but I always do it in a non-stick pan and just drizzle a little oil. It works perfectly. 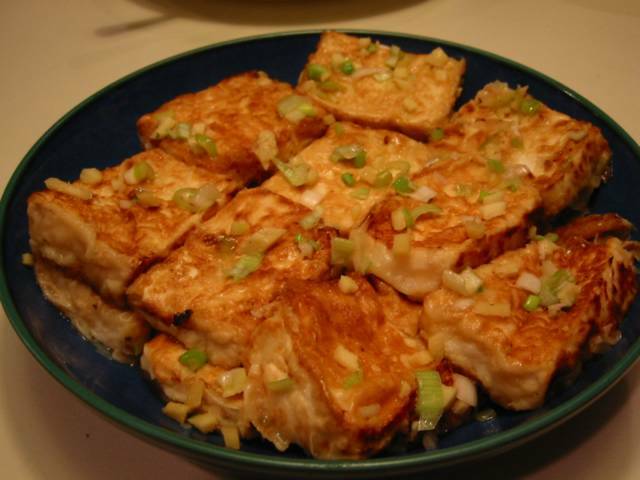 Tofu, also known as soy bean curd or tokwa, is made by curdling soy bean milk. Curdling is aided by calcium sulfate - a naturally occuring mineral. 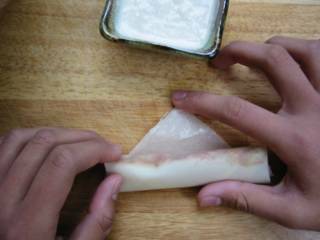 After curdling, the mixture is then pressed to form tofu. So essentially, tofu is soy bean cheese. Here in the west, there are two types of tofu - the firm one (this comes in blocks) and the silken one (called taho in Phils.). Although when we were in Hong Kong, they have an even firmer type of tofu which are in rounded pieces similar to buffalo mozarella except the former is flatter and squarish in shape. The extra firm and firm ones are good for general cooking. The silken one has a very soft, smooth and creamy texture and is used a lot on desserts. Also in Hong Kong, there are hawkers who fry and sell preserved tofu right on the street. The problem is they f*&%$ng stink big time! Oh, I swear you could smell it from a mile back! This is very prevalent in the area of Battery Path going to St. Paul's church - uggh! However a lot of people I know (Chinese, Gweilos, even Pinoys) insist that they taste great. Must be the durian syndrome in them. Combine ingredients for the sauce in a small bowl and set aside. Heat a little oil in a non-stick frying pan. 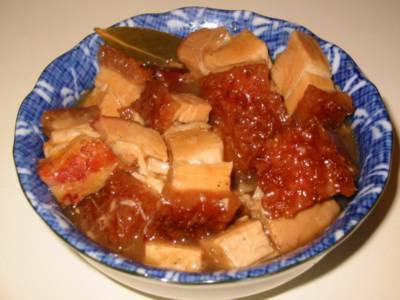 Cut the bean curd into 1/2-inch thick slices. Coat with flour and then dip into the egg. Fry bean curds over medium heat for 1 minute each side or until golden brown. Wipe clean the frying pan and sprinkle half of the green onions and ginger in the pan. Arrange the fried bean curds on top then pierce the bean curds with a fork to allow liquid to seep through. Sprinkle the rest of the green onion and ginger on top of the bean curds and pour in the sauce. Turn on heat and bring to boil. Turn down the heat to low and cook uncovered until almost all the liquid is absorbed by the bean curd. I am such a sucker for "award-winning recipes" in magazines. Once I see that heading in a publication then I grab it as if somebody's out to beat me to it. I try most of the recipes and so far about 90% came up trumps. This one is from the magazine ... ah ... I can't remember coz I cutout just the recipe itself. I'm sure it's a US edition. It must be either Good Housekeeping or Red Letter or Family Circle - take your pick. It is touted as a "top winner at the Central Washington State Fair last year". What year it was I ain't got a clue - probably 1994. Great baker who made this is named Myrna Myhowich. So Myrna, wherever you are thanks for this recipe. Preheat oven to 180C/fan 160C/350F. Grease bottom (not sides) of a 9 x 5 x 3-inch loaf pan. Sift together flour, baking powder, bicarbonate of soda, cinnamon, nutmeg and salt into a bowl. Set aside. For the topping: combine sugar, cinnamon, and nutmeg in a small bowl. Set aside. Beat together sugar, butter, eggs, vanilla, and lemon rind in a large bowl for 1 1/2 minutes until light and fluffy. By hand, stir in flour mixture, being careful not to overmix. Stir in apple and nuts (if using). Spoon batter into prepared pan. (Optional) Sprinkle topping evenly over top of batter. 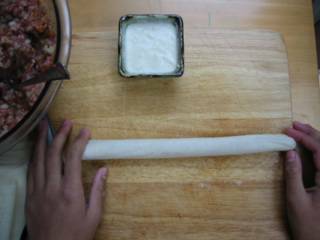 Bake in preheated oven for 50 minutes or until loaf is browned, begins to pull away from the sides of the pan and a skewer poked in the middle comes out clean. Cool cake in pan on a wire rack 10 minutes. 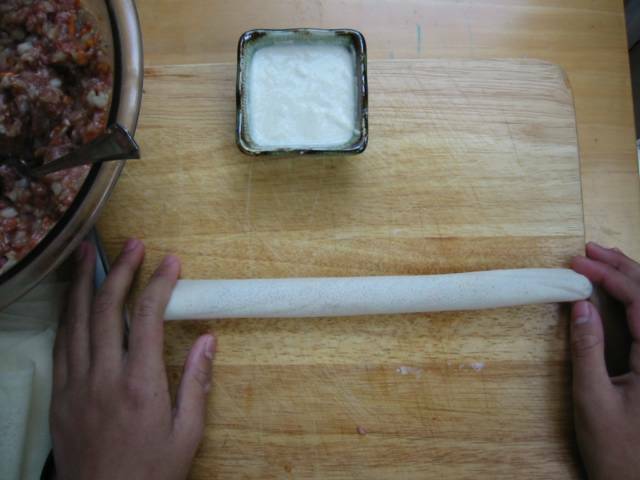 Loosen loaf around edge with a metal spatula and invert; turn right side up. Cool completely. My mother never liked beef it stemmed from her childhood experience of being served 'beef' when it fact it was kalabaw (water buffalo) meat. It was wartime and meat was in very short supply. They have to make do with whatever they have. They were actually lucky to have kalabaw meat although I think the poor beast died that's why they have to slaughter it. Somehow it tasted so ma-anggo (very beefy) for her that she never ate any ever again in her life. The banned clique included venison, mutton, and lamb. But she was also determined that her children should not be visited by this prejudice on certain red meats so she periodically fed us beef. One of the more frequent dishes she served was mechado. Although she never tasted it as she cooked, it was nevertheless good. This is her recipe although the lemon slice, I got that from Nora Daza, is just to give a little acid kick. Do not attempt to put a slice from a waxed lemon or to cook it for a long time or you will have a somewhat bitter aftertaste in the dish. Heat oil in a heavy-based saucepan or pot. 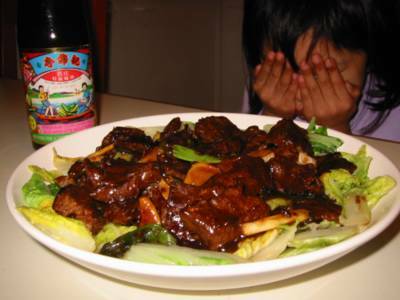 Brown beef briefly in oil and set aside. In the same pan saute garlic and onion for 5 minutes or until onion is translucent. Add in browned beef, tomato sauce, water, laurel leaf, soy sauce, peppercorn, salt, and lemon slice. Bring to boil and simmer for 3 minutes. Remove lemon slice. Simmer and cook for about 1 hour 15 minutes or until beef is tender. Add in potatoes and carrots. Cook for a further 10 minutes or until potatoes and carrots are cooked. Serve. I don't know it this is really a Filipino-Spanish dessert or if it is imported from somewhere. All I know is I saw these in Filipino homes in the cities or suburbs not in the provinces so I'm sure this is not traditional. Anyhow this is well loved by our Brit friends because it is so close to their English trifle dessert. This recipe is just a layering of sponge cake followed by custard (creme patisserie) then fruits and then topped by gelatin. I cheated on this by way of having ready made sponge cake (trifle sponge actually) for the base. I have this phobia of making sponge cakes ever since I attempted one back in Pinas and it turned in the consistency of a hockey puck ! For the fruits, I use canned peaches and pineapples and some glace cherries. If you want to use fruit cocktails it's fine as well just make sure to drain it well. I have not tried using fresh fruits on this. 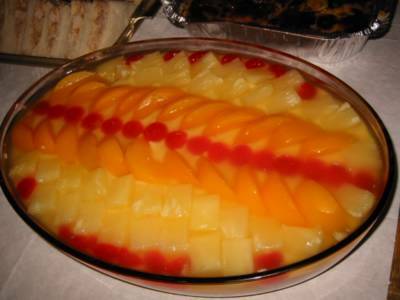 The gelatin can be made plain by replacing the fruit juice with water. Combine all ingredients in a heavy based saucepan. Stir constantly while bringing it gently to boil until it thickens. Blend all ingredients in a saucepan and cook for about 15 minutes or until the gelatin is well dissolved. Cut the sponge cake to fit the serving pan. Put in the sponge cake as the first layer. Spread the custard filling on top of the sponge cake, making sure to level and even it out all over the pan. Arrange the canned fruits on the custard. Pour in the gelatin on top; if possible, completely submerging the fruits. Chill in the fridge until the gelatin is set.